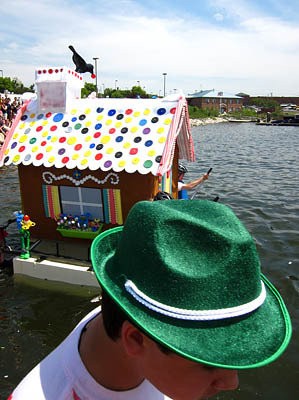 It was a warm and sunny day May 1 for the the twelfth Baltimore Kinetic Sculpture Race East Coast Championship. The Frog ended nine years of monotony by diving nose-down into the harbor twice. Many teams got stuck in the sand and mud—both of which featured fancy new timers to ensure that ACE sculptures failed to linger. Two sculptures managed to break down within five yards of the starting line—but one’s emergency repairs were so successful it went on to win the Championship. Whenever dozens of artistic teams work independently, peculiar coincidences of theme are likely to arise. This year we had two odd conicidences. First, the simultaneous appearance of two anglerfish. Second, the novel appearance of two giant 6-pilot articulated caterpillar sculptures led by artistic umbrellas—each created independently and with a very different theme. For 2010, KineticBaltimore.com is pleased to present new vantage points provided by the expansion of our team to seven members. You’ll see photos from a kayak (thanks to Water Posse volunteers) and other places we’ve found with new perspectives on the race. Our photos have also grown 44% more pixels since 2009 so you can see more detail. 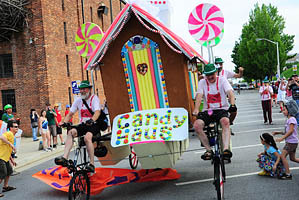 Taking home the Grand Mediocre East Coast Championship was Candy Haus, with four pilots. Immediately after they entered the water, spectators realized they had no apparent means of aqueous propulsion as they began to drift. 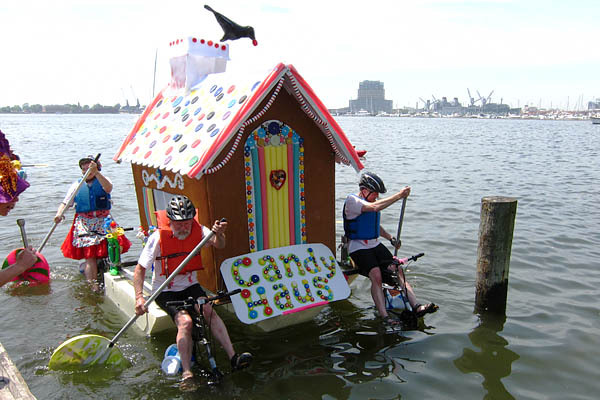 Then with astonishing precision the four pilots simultaneously reached out and removed the nearest giant lollypop, dipped the business end into the harbor, and began synchronized paddling. A wave of appreciative oohs erupted from the crowd. 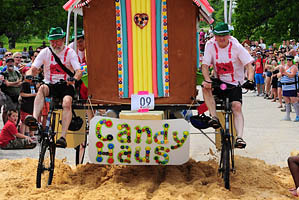 Candy Haus began the race with tribulation: they broke down yards after the Le Mans start. They pulled out of the way so others could pass and began sculptural surgery. 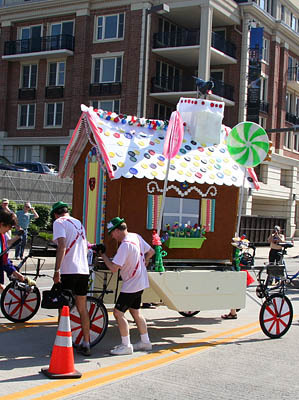 A few minutes later they were ready for the ascent of Federal Hill. The pilots and pit crew sported green Alpine hats. 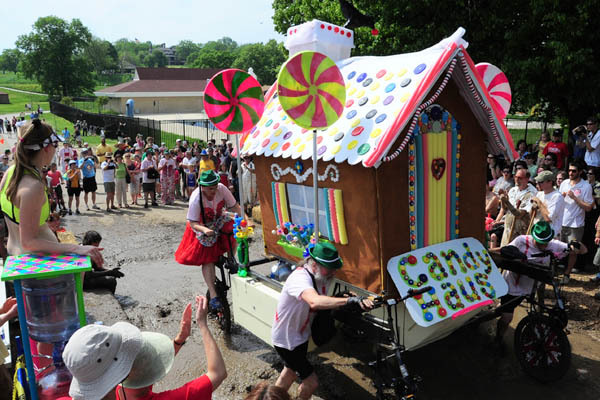 Candy Haus comes from the same Takoma Park team as 2009’s Snakehead. 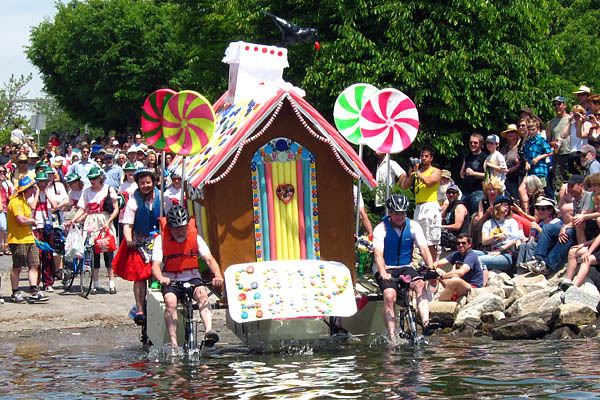 They sailed through the sand, and broke the tape in style at the finish line. They needed to dismount to get through the mud—which would have disqualified them from an ACE award, but continuous self-propulsion is not required for the Championship. On the left side of the photo, Becky’s Mud Vortex Timer went undeployed because they never ceased making forward progress. Here the team receives its championship trophy—topped by gold-plated bicycle handlebars—at the awards ceremony.